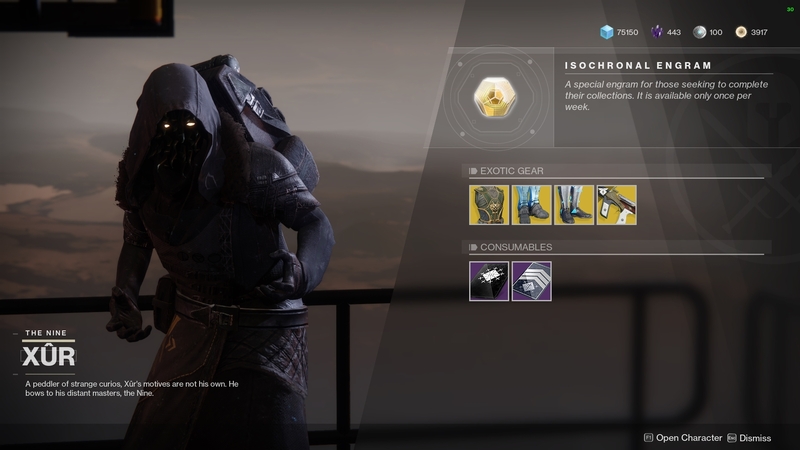 Hot on the heels of the announcement of Destiny 2: Forsaken, Xur has returned to the game with a selection of Exotics for your perusal. Sadly, only one of Xur's items this week is a new one from the Warmind expansion, but luckily it's a pretty cool one. Let's take a look at where Xur is and what he has to offer for the weekend of June 8, 2018. 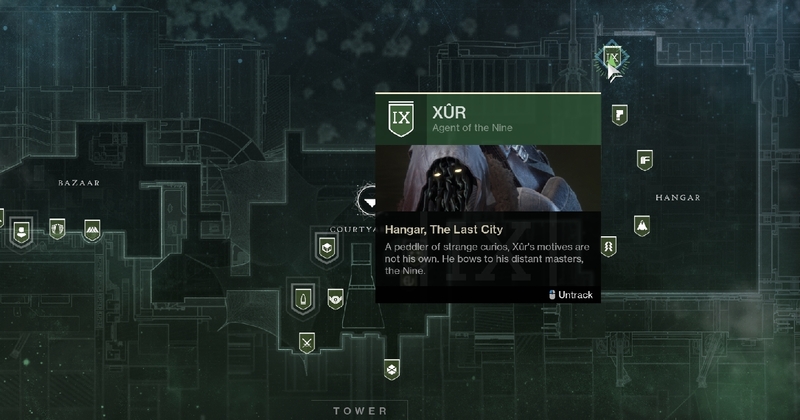 Since this week's Flashpoint is on Mercury and not all players have access to that location, Xur is in the Tower. He's in his usual spot in the Hangar section of the map behind Arach Jalaal of Dead Orbit. This week's weapon is The Huckleberry, a new Exotic submachine gun. This gun's perk, Ride the Bull, increases your rate of fire and recoil while you're holding down the trigger, but kills with it will reload a portion of the magazine. When it's coupled with the Rampage perk, which grants increased damage with kills, it becomes pretty nasty when dealing with large groups of enemies in PvE. It costs 29 Legendary Shards. For Hunters, this week's armor is The Dragon's Shadow. Its main perk, Wraithmetal Mail, reloads all weapons and increases both movement and weapon handling speeds for a brief time after using the Hunter's Dodge ability. It costs 23 Legendary Shards. This weekend's Titan armor is Peacekeepers, which are boots. These boots will reload your stowed submachine guns and allow you to ready them instantly, so they're a must-have if you enjoy using SMGs. They cost 23 Legendary Shards. Warlocks get another pair of Exotic boots this weekend: Transversive Steps. These boots increase your movement speed and automatically reload energy weapons while sprinting. They cost 23 Legendary Shards. The Huckleberry is definitely worth a buy to mess around with in Patrols and events like Escalation Protocol, so be sure to pick it up before Xur leaves at next week's reset.